Ever tried buying a web domain for yourself or your business? If yes, then chances are that you’ve come across Namecheap - the second-largest domain retail registrar in the world. On a mission to make building websites accessible and affordable for everyone, the company offers services such as domain registration, web hosting, and website building. Namecheap employs over 1200 people working from on-site, co-located, and remote offices spread across the globe. This mix of talent is a strength - the team has different levels of expertise, varied senses of humor, and a mosaic of cultural backgrounds to draw inspiration from. But being spread out is also one of their biggest challenges, especially when teammates on opposite corners of the globe work together on projects. Email worked for formal communication but it wasn’t great for extensive collaboration or real-time feedback. Video conferencing systems worked for quick meetings but weren’t great for large groups. Differences in time zones made scheduling meetings trickier. HipChat worked for instant messaging but the team soon realized that they were using too many tools to achieve one goal. 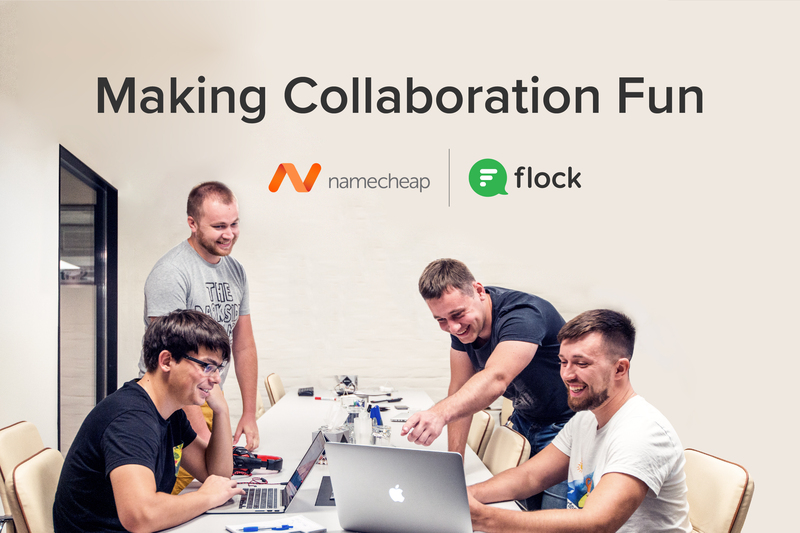 The team at Namecheap uses Flock to cut down on the 'transit time' in exchanging information so they can move faster on projects and tasks. They use it to quickly identify each team member’s availability (presence) and the tasks they are working on (custom status). This makes collaboration seamless, with team members looking up a colleague’s availability on Flock in a second rather than asking the dreaded “Hey, do you have a few minutes?” question a few times every day. They are also heavy users of Flock’s built-in productivity tools such as Shared To-dos and Reminders. This saves team members all the time wasted on juggling half a dozen different tools and allows them to track tasks and complete projects faster. They also love hosting quick video conferences within Flock to discuss ideas and share updates. Finally, the ability to connect third-party business tools to Flock means that it brings together all their work in one place. For example, last September, Namecheap crossed 10 million domains under management - they are only the third registrar ever to achieve this! To recognize and celebrate this milestone, the company hosted contests and discussions in Flock channels, with hundreds of employees participating in them across time zones, borders, and offices. Ultimately, Flock helps Namecheap bring together a global team of people into a virtual office where working together is easy, fun and engaging. And it comes with advanced productivity tools built-in, so the team gets more work done in less.